Ross introduces a new Ribbon Blender Model, the 42NSD-1S, a multi-purpose unit equipped with interchangeable double ribbon and paddle agitators. With a maximum working capacity of 1 ft3, the 42NSD-1S is ideal for most laboratory and pilot-scale blending requirements. 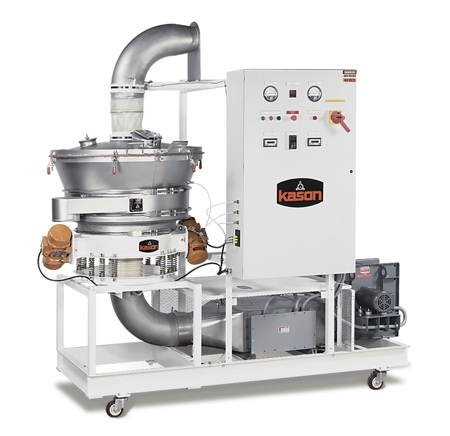 This vacuum-rated blender also comes with a Discharge Extruder Assembly installed along the bottom of the trough to enhance mixing, eliminate dead zones and enable 100% complete discharge. The unit shown is supplied with NEMA 4X controls with variable frequency drive (VFD) keypad for convenient soft start and speed control of both the main agitator and the screw auger of the discharge extruder. Ross Ribbon Blenders are commonly used for blending dry powders, granules, pellets and other solid forms. The agitator’s inner and outer helical ribbons are pitched to move material axially, in opposing directions, and also radially. This combination promotes fast and thorough blending. Paddle agitators deliver gentler mixing which is more suited for shear-sensitive and friable applications. Both systems also function as paste mixers, vacuum dryers and granulators/coaters (evenly coating a liquid or very fine solid component throughout the surfaces of larger particle ingredients). All Ross blenders are direct-driven by an inverter-ready gearmotor, a low-maintenance design superior to antiquated belt- and chain-driven blenders, which suffer from losses in horsepower and efficiency through slippage. Popular options include sight/charge ports, safety gratings, pneumatically-operated covers and discharge valves, sanitary construction, spray bar assembly, heating/cooling jacket, caster wheels for portability, explosion-proof operator stations and HMI/PLC systems.